Relaxshacks.com: The M.I.T. "Soft Rocker" Micro, Solar Cabins- Charge your gadgets while relaxing! The M.I.T. 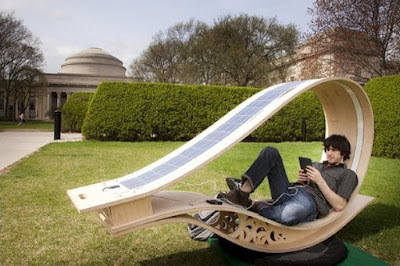 "Soft Rocker" Micro, Solar Cabins- Charge your gadgets while relaxing! Reader Sam Brelsfoard sent me this one- and as its right around the corner from me, I'd love to go check these out in person! He also mentioned "Slap some walls on 'em, and you'd have yourself a micro-cabin/ultra tiny house"- which isn't far from the truth! Well, maybe widen them a little. 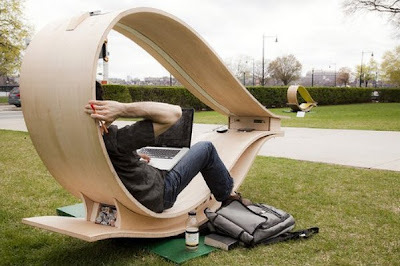 I love the sleek, molded plywood look of these- almost like a teardrop that fell on its side....Thanks Sam! 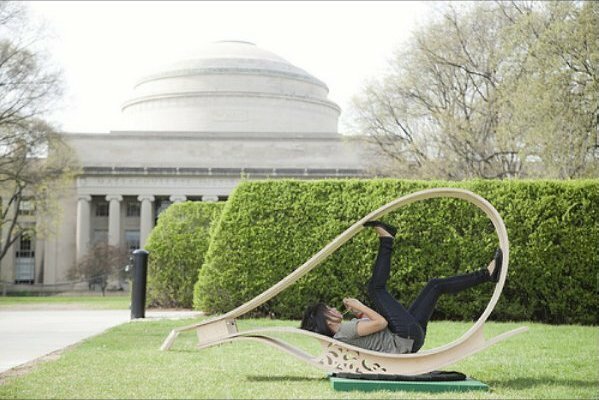 From http://www.engadget.com/....Wander through MIT's Killian Court and you'll spot something distinctly modern nestled amongst its classical buildings -- a set of solar-powered lounge chairs called SOFT Rockers. These curved, solar-panel-covered seats rotate on an axis to keep them facing the sun, generating additional energy from the rocking motion created when people climb inside. All that harvested electricity can be used to recharge gadgets plugged into the three USB ports and to illuminate a light strip on the inside of the loop. 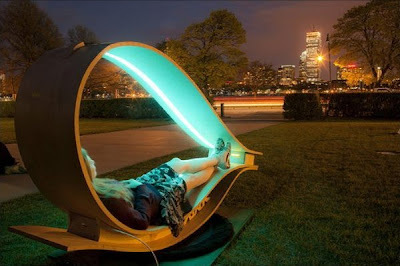 The teardrop-shaped charging stations were created by professor Sheila Kennedy and a team of students for the Festival of Art+Science+Technology (FAST) as an antidote to "conventional 'hard' urban infrastructure." Plus, they seem like a great place to charge your phone while evading Dean Wormer and riding out double secret probation.